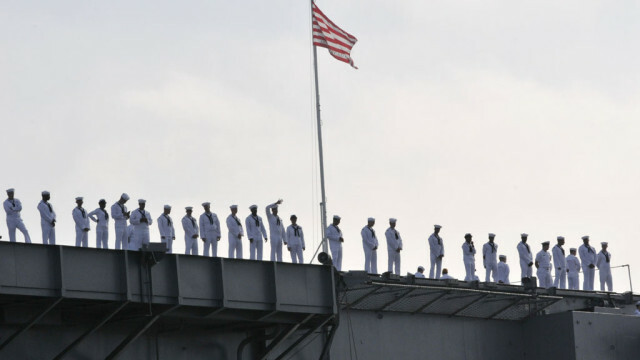 After over 2,000 combat missions, the ships and crews of the Carl Vinson Carrier Strike Group are scheduled to return to San Diego next Thursday, the Navy announced. The aircraft carrier USS Carl Vinson, guided-missile cruiser USS Bunker Hill and guided-missile destroyers Dewey, Gridley and Sterett left San Diego in August for the Middle East, where they supported strikes on Islamic State targets. The Navy said aircraft aboard the Vinson conducted 12,300 sorties — including 2,382 combat missions — and dropped 869 precision guided bombs. The strike group was relieved by the aircraft carrier USS Theodore Roosevelt‘s task force in mid-April. The “Big Stick” is scheduled to relocate to San Diego at the end of its deployment. “The successful completion of such a lengthy deployment is a testament to the high quality of men and women who volunteer to serve in our United States Navy,” said Rear Adm. Chris Grady, Carl Vinson CSG commander. The Vinson is also bringing home Helicopter Sea Combat Squadron 15, the Red Lions; Helicopter Maritime Strike Squadron 73, the Battlecats; and Fleet Logistic Support Squadron 30, all based at Naval Air Station North Island. Combat aircraft aboard the Vinson are based at air stations across the West, with one squadron based in Virginia.